Florida Circle Tours brochure produced by United Tours in 1950. The brochure details a nine-day coach tour of Florida starting in Jacksonville and traveling to Silver Springs, Orlando, Winter Haven, Cypress Gardens, Tampa, St. Petersburg, Snell Island, Tampa Bay, Tamiami Trail, the Everglades, Miami, Miami Beach, Coral Gables, Palm Beach, Indian River, Daytona Beach, Marineland, St. Augustine and Ponte Vedra. It also lists optional trips to Havana, Cuba or Nassau, Bahamas by air or steamer. United Tours was located at 329 East Flagler Street in Miami, Florida. Original brochure, 1950: United Tours, Miami, Florida. : Private Collection of Thomas Cook. Digital reproduction of original brochure, 1950: United Tours, Miami, Florida. Originally published by United Tours. Copyright to this resource is held by United Tours and is provided here by RICHES of Central Florida for educational purposes only. "Downtown Orlando Historic District Walking Tour"
Choice of Hotels, Sightseeing, Etc. FIRST DAY--Leave Jacksonville at 9:00 A. M. Your motor coach takes you directly to SILVER SPRINGS. Here you will see Nature's "Underwater Fairyland" from a glass bottom boat. On this cruise you will view many fantastic geological formations, brightly colored tropical fish and sub-aquatic plant life. Leaving Silver Springs, you will then proceed to Ocala and a drive through the citrus producing belt along the ridge section to ORLANDO, the "City Beautiful" that has thirty-three lakes within its city limits and old live oaks draped with Spanish moss. Overnight stop at the HOTEL ORANGE COURT. Room with bath. dinner and breakfast are provided. SECOND DAY--Leave Orlando at 9:00 A. M. and motor through Florida's scenic lake country to Winter Haven. A short side trip is made to visit famous CYPRESS GARDENS in the center of Florida's beautiful lake country. Ample time is allowed to enjoy the natural beauty of the grounds and view the magnificent gardens. After returning to Winter Haven you now proceed through Plant City, "Strawberry Capital of the World," and Tampa, one Florida's commercial cities, across GANDY BRIDGE to St. Petersburg for your stay at the HOTEL SUWANNEE. Romo with bath, dinners and breakfasts are provided. FOURTH DAY--After breakfast leave St. Petersburg at 8:30 A. M. via the famous BEE LINE FERRY across Tampa Bay to BRADENTON, thence to SARASOTA, FT. MYERS--through the heart of the EVERGLADES over the TAMIAMI TRAIL Highway. You will be fascinated by the wild, tropical scenery, many varieties of birds, the colorful SEMINOLE INDIANS in their native environment, dressed in gay costumes of intricate geometric designs. Arriving at MIAMI the metropolis, thence by bus to MIAMI BEACH. Transfer to OCEAN-FRONT HOTEL. FIFTH DAY--MORNING--A sightseeing tour visiting MIAMI BEACH, LINCOLN ROAD, COLLINS AVENUE, 79TH STREET CAUSEWAY, HIALEAH RACE TRACK, SEMINOLE VILLAGE and ALLIGATOR FARM, TROPICAL HOBBYLAND, Dinner Key, COCONUT GROVE (Miami's oldest section, rich in botanical beauty), SAUSAGE TREE, CORAL GABLES, the home of the UNIVERSITY OF MIAMI, VENETIAN POOL, FRUIT GROVE, LUMMUS PARK, OCEAN DRIVE, PALM, STAR AND HIBISCUS ISLANDS. SIXTH DAY--Morning free. AFTERNOON--A cruise through the scenic waters of NORTH and SOUTH BISCAYNE BAY and MIAMI BEACH, viewing the many islands, SAN MARINO, DI LIDO, BELLE and the VENETIAN CAUSEWAY, homes of many nationally known celebrities, and hundreds of paltial estates, INDIAN CREEK VILLAGE, North Bay Island, the new RICKENBACKER CAUSEWAY, BISCAYNE and VIRGINIA KEYS, MIAMI SKYLINE and many other points of interest. EIGHTH DAY--Leave Miami Beach at 8:80 A. M. via the East Coast along the Atlantic Ocean through WEST PALM BEACH--FORT PIERCE--COCOA--MELBOURNE and the beautiful INDIAN RIVER orange groves to DAYTONA BEACH. Arriving at 3:45 P.M. you transfer to the famous PRINCESS ISSENA Hotel for and overnight stay. Room with bath, dinner and breakfast are provided. NINTH DAY--After breakfast, transfer to Bus station for departure at 9:50 A. M. for a drive along the Ocean Highway to MARINELAND, where ample time is allowed to view this amazing display of marine life. Through portholes at the MARINE STUDIOS you can see hundreds of fish living under conditions comparable with that of the open sea. After watching the feeding, you board your motor coach at 12:55 P. M. which takes you to ST. AUGUSTINE where a sightseeing tour of this interesting city is made visiting such points of interest as: THE OSTRICH FARM, THE OLDEST HOUSE, HENRY FLAGLER ESTATE, FORT MARION and the FOUNTAIN OF YOUTH. In the late afternoon you again proceed along the Ocean Highway via PONTE VERDA and BEACHES to Jacksonville arriving there at 5:20 P. M. in time to make any north-bound connection. TOUR RATE INCLUDES--The rate of $104.50 is per person on the basis of two persons in twin-bed room and includes transportation from Jacksonville back to Jacksonville, room with private bath at hotels. Dinner and breakfast included at all overnight stops outlined (no meals included in Miami or Miami Beach), all transfers, admissions and sightseeing as scheduled. SINGLE ACCOMMODATIONS-- $10.00 additional is charged for single room in hotels. STOP-OVERS--Stop-overs senroute may be arranged and those who wish to may extend their stay in Miami Beach for a side trip to HAVANA or NASSAU. RESERVATIONS--Early reservations are essential and advance reservations can be made through the office where this folder is received. NOT INCLUDED--Government taxes ($5.90) tips or items of personal nature. NOTE: Comparable Florida Circle Tours are operated throughout the Winter Season, Dec. 1st through April 30, at slightly increased rates. Follow the trail of the modern explorer and discover with us the endless scenic variety and natural beauty of Florida. To absorb the sunshine on Coral White Beaches; see the natural beauties of Tropical Gardens, Mountain Lake Sanctuaries and the magic revealing of under-water life. From one end of the State to the other your interest can never lag in the ever-changing scene. 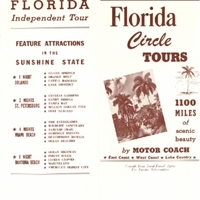 “Florida Circle Tours Brochure.” RICHES of Central Florida accessed April 23, 2019, https://richesmi.cah.ucf.edu/omeka/items/show/995.